Well, it’s ITB season, that time every year in Flagstaff when runners have ramped up their hill work to compete in the Imogene Pass Run, a 17.1 mile race up and over the Imogene Pass in Colorado. 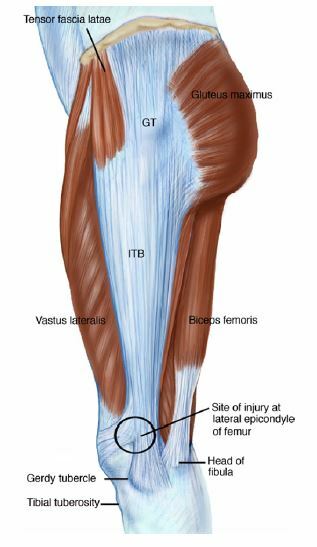 Iliotibial Band Syndrome is characterized by pain and focal tenderness in the lateral knee. Specific aggravating activities include sprinting, running down hills or stairs, cycling up hills, and walking or hiking two or more miles. Usually discomfort increases as subjects continue to perform the implicated activity and pain usually stops with cessation of activity. Though runners and cyclists are the most affected by this condition, it can also rear its head with other high volume activities such as aggressive walking, hiking and any activity involving repetitive flexion and extension of the knee. The iliotibial band (ITB) is a thick band of fascial tissue taking its fibers from the gluteus maximus in the back of the hip, and tensor fascia lata muscle on the outside of the hip. The ITB then travels down the outside of the thigh and knee and inserts into the lower leg. Biomechanically, bending and straightening the knee causes the ITB to move over the bones at the outside of knee. Functionally, high mileage, quick ramping up of training and repetitive flexion and extension about the knee predispose a susceptible individual to this injury. Genu varum (“knock-knees”), greater body mass and height and ITB tightness have been implicated as possible anatomical causes of ITB syndrome. Some sources also implicate excessive mid-foot mobility (sometimes referred to as over-pronation) and hip abductor or rotator weakness as predisposing factors. It has also been suggested that leg length discrepancy, either structural or related to muscular imbalance in the pelvis or lower extremity, might create a pelvic tilt that puts excess stretch on the band of the longer leg. In addition, weakness of the large gluteus maximus muscle may allow the ITB to migrate forward on the outside of the thigh; this migration leads to shortening of the ITB and increased compression or friction at the knee or hip bones. In the acute phase of injury, activity modification is advised and includes decreasing mileage/activity and resting, local ice massage, anti-inflammatory medication, and corticosteroid injection have proven effective in reducing symptoms. In the subacute phase, stretching and myofascial release are helpful to increase tissue length and decrease muscle tension. There is a small study of Graston Technique (using metal instruments to treat limited soft tissue mobility) that showed immediate improvement in symptoms. Holly Nester, PT, at our east clinic, is one of the few certified Graston practitioners in Flagstaff. During the recovery phase, it is advised that the subject introduce progressive strengthening exercises for the hips and core stabilization exercises to improve coordination and control about the hip, knee and trunk. Return to activity includes easy sprints and gradual increase in distance and frequency. Recovery may take 6-8 weeks, if symptoms are suppressed well enough in the beginning, so be patient and understand that too-rapid return may cause recurrence of symptoms. Return to activity may also be facilitated by orthotic consultation and implementation if structural or anatomical contributions are a factor predisposing some individuals to this condition. If you want to read more about Iliotibial Band Syndrome, have a look at this article published in 2011. It gives a lot of detail about the condition and treatment, but really it says the same this this blog post does – treatment requires a careful examination to identify the biomechanical cause of the condition and correct it. If you are looking for a physical therapist with the time and expertise to perform that kind of assessment, please contact us!